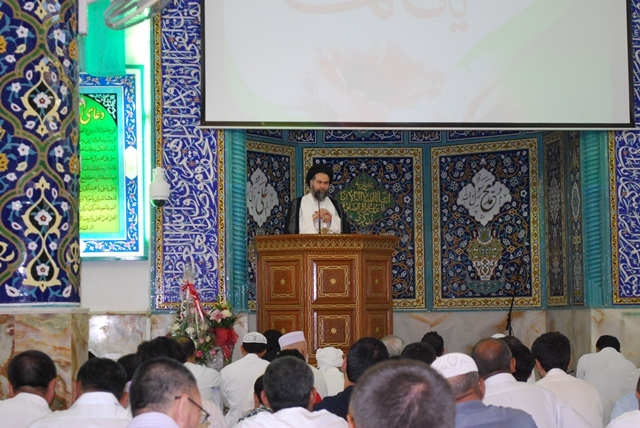 On last Friday of Ramadhan 1433, the Friday prayer was held in Imam Hussein (a.s) Mosque Dubai by Ayatollah Sey’yed Mahmoud Madani. The following is brief of the first sermon. In first sermon after Allah’s praise, encomium and reciting peace upon Mohammad (s.a) and his immaculate pure and chosen family he advised himself and all the prayers to have the Allah’s virtue and told we practiced one month to control our sensuality for hunger, thirst, pressure of passions and pleasure. Fasting is a practice to be patient against the sensuality. Fasting is going to be finished but the patience and tolerance and confronting sensuality should be continued. We should keep our tongue of haram talks, our hands of sin and cruelty, our feet of stepping towards the sin, and the cruelty that might be initiated from our side at home or office or market should be face to our resistance. Our soul which is hardened as steel in Ramadhan’s furnace and the spirit which has polished and changed to a shining one should show him in next 11 month by standing against the sensuality and the Satan. Oh, Allah, we are your guest in your home in Friday, by all humility and maximum of poverty strike our hands towards you to ask Oh, Allah, grant us the virtue in all of our life stages. Grant us the success of leaving the sin and repentance in a manner that you like, performing the worship and good deeds to us and our children as well. Oh, Allah, grant us whatever granted to your friends and keep us of whatever you have kept your friends from and excrete the evil of the world and hereafter of us and our family and generation. 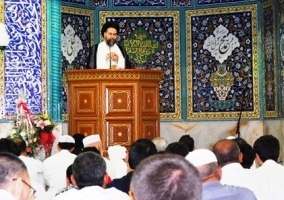 Then Ayatollah Madani continued his weekly discussions in Friday sermons and told:”Our continuous discussion is about the Exemplary Islamic Society. We finished the exemplary Shia within our previous time opportunities. Today is the last Friday of Ramadhan and is the Qods day named by Imam Khomeini (r.a) and in reality is the Islamic Nation Day. So for this occasion we will explain the characters of an Exemplary Islamic Society. I will finish this subject only in this sermon. In a short and brief, as per the understandings of the Islamic scholars of versus and hadith, the man has two natures, one individual existence and the other social one. Our social nature is independent of the individual one. You can see in the Qur’an that we have individual death and social death. Somewhere has told that “Kollo nafsen zaeghatol mout”- each individual will die and in another place you can see that has told “Le kolle ommaten ajal”- the nations also have death. In Resurrection day also they will give our action letter to our hand and also has told in Qur’an that “Kollo ommaten tad’a ela ketabeha”- each nation has its own action letter. It seems that we will have two judgments, one for our individual performance results and the other one as an Islamic nation. As an Islamic Nation we have responsibilities and should have specific characters and Allah expecting us as an exemplary nation these specifications. Now I will note some of these characters. The first property of an exemplary nation is the solidarity and continuity soul. If we consider the nation as a body the soul of that would be this fraternity and love to each other. He gave the example of the best man after Prophet Muhammad (PBUH), Imam Ali-ibn-Abitalib’s government. What made his heart full of pain in that time was the fact that the body of the society was together but the souls were far and separate. Ayatollah Madani added that it is shameful for us as an Islamic nation because in each and every point of the Islamic countries blood and flame is on flow. Fratricide in Islamic countries injures our hearts. Look at the shamble of Palestine and neighbor country of Lebanon, Libya, injured Iraq, look at the oppressed Pakistan and go from there to Myanmar and Bahrain. Everywhere we feel shame before Allah and his prophet. So strange, what has happened that this nation is in fight with each other? What made them so cruel to each other? Is this the same that our prophet expecting us? What will be the answers of the scholars of this nation before Allah? The people of this nation what will answer before the prophet? This nation’s authorities what will answer before Allah? He continued that Prophet Muhammad (PBUH) while last Haj pilgrimage in Khif Mosque told that the Muslims should be like a unique hand in confronting to whomever is going to cruel or bullying Muslims. The fingers of the hand has their own individual existence but in confronting the enemy they become close to each other making a unique fist and striking to the chest of the aggressor. Are the fingers of the Islamic nation similar to this or they are pointing each other? They are hurting each other. The meaning of the Prophet’s speech is that you are in a same ship and if someone digs a hole in the ship all will sink. The Islamic nation are ride over the ship, any damage to the ship will hurt entire ones. He referred to Imam Khomeini’s call for unity of the Islamic nations but what was the answer instead? Today we should take serious the unity of the nation and besides inviting each other for unity look for those whom are trying to apart the nation either unwise enemy or stooge scholars which listening to foreigners and Zionist. Those whom sentencing and the latest sentence is that the selling the land to Shias is Haram! What has happened? Whether the Shias are the enemy for Sunnis or the Sunnis are Shias enemy? Then he referred to the second character of the exemplary Islamic nation and told that the nation should be intermediate and follow the moderation. Islam ordering nation to be moderate and extremes are wrong in all stages of the life. He asked that do we have anything better than the worship. We have hadith in Vasayel-Al-Shia about the economy in worship; means that even in worship we shouldn’t exceed the indulgence and should keep the middle side. Moderate means whatever Allah has told. He continued about the ownership in Islam and explained that we are neither following the Marxism ideology which entirely negates the individual ownership nor the Liberalism ideology which gives the unlimited ownership to individuals unless the fund itself would be in danger. Islam is not accepting many incomes and says these are illegitimate like lucre, bribery, licker trade or weapon trade if going to be used to kill the opposed people. Ownership is neither the one that communists are telling nor the one westerners telling. Ownership is respectful if follows the frame of Halal income. Ayatollah Madani continued his speech about the moderation in tenderness and explained that the one who has no tenderness to the society is not a faithful person and also the one who tries to love each and every one is the same. We are not eligible to have tenderness toward Allah’s enemies. Ayatollah Madani continued his speech explaining the current situation in Islamic World and told that today we are impacting of either the radicalism or tardy movement. Sometimes there are people in every sect that think today Jihad means to fight to each other, insult others. This is not the Islamic moderation path. Some others have fallen from other side and avoid any discussion about the sects. No, I myself as a Shia should understand my sect and persist on that. I should recognize my belief and duties while respecting all other Muslim brothers and sisters. Aberrant extremes and violence is harmful for the Islamic Society. The supreme leader sentenced that insulting scholars of Sunni Muslims is Haram, as it will ignite a riot fire that will not be preventable. We need the moderation in our family behavior, society, political issues and dealing with political parties as well. It may happen an election makes irregularity in a society. He added that the third and last character of the exemplary nation is the ability to recognize and resist the enemy. He gave an example of AIDS disease which is known for everybody and it damages the immune system of the body and compared with the current situation of the Islamic nation and explained if a society neglect the enemy and loose its resistance against the enemy will be affected by social AIDS. Imam Khomeini announced the Qods Day to prevent this. Our enemy is serious to extirpate us. This day is for understanding that Shia is not enemy of Sunni and Sunni is not the Shia’s enemy. Persia is not the enemy of Arab and Arab is not the enemy for Persia. The neighbor countries are not enemies, the enemy is somewhere else. The enemy is the one that we asleep and forgotten that. Enemy is the one that through the TV channels and media sources daily comes to our houses while has the support of the Zionist. The one who has captured the world’s economy and controlling our economy is the enemy. The recognition of the enemy will make unity in the Islamic nation. We should understand that the Qods issue is not only Palestine or Lebanon problem; it is the Islamic world’s problem. The enemy’s motto is “From Nile to Furat” even excess of that they are targeting entire Islam. We pray that Allah grants the Unity, enemy recognition and moderation to Islamic nation. Ayatollah Madani then pointed to earthquake of Azerbaijan and wished forgiveness for those passed away and patient for the remaining. He advised that we should use our effort and have the share to hill up the injuries of the affected people. The last part of his speech was about the recognition of Eid-ul-Fitr. He told thanks God that the beginning of the month of Ramadhan was consisted by all the Shia Scholars and as the starting day was Saturday so the Eid might be either the next Sunday or at last the next Monday. He explained that the enemies like to make it an issue but we should avoid and each one will follow the moon sight to happen. It is not a geographical matter but it is just the appearance of the new moon as per the narrations both from Shia sources as well as Sunni ones. So if happened that all the Scholars sentence a unique day for Eid or if it proves for some or not proves for others better to follow the relevant Scholar and avoid any discord. At the end he prayed that everybody leaves the Ramadhan month in pure and had his prays. The second sermon told in Arabic for Arabic speaking sisters and brothers.